Thank you to everyone who got involved last month. Now to February's giveaway and I have three really exciting prizes. 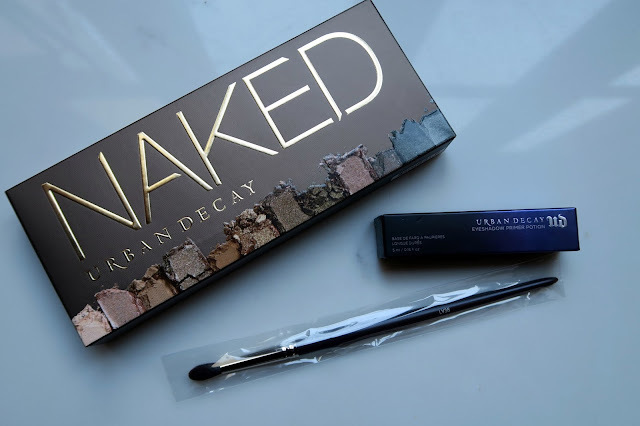 The original Naked Palette from Urban Decay is 7 this year and although I have one in my kit that I do use sometimes, it is here as the winner of the go-to eye palette for my personal use. Whenever I don't know what eye make-up to wear or I don't have very much time, or when I go on holiday this is the palette I reach for. There have been many imitations and attempts to do one better but for me none of them have come close. Yes there is some drop down with this but that's why, in the olden days, you used to get a mini primer potion with this. You don't any more but I am including a full size Urban Decay Primer Potion as part of the giveaway. Drop down doesn't bother me, use a primer and you are good to go, lack of pigment bothers me and its the pigmentation, colour payoff and really wearable, beautiful colours that make this my favourite personal eye palette. I will do a full review of this later in the month and a make-up look on the YouTube channel so you can see it in action. Nowadays the Naked palette comes with a double ended brush (it used to be single ended and one of the only brushes that comes with a palette that is actually usable. I think Louise Young's is the only other one I can think of and her palette is my favourite to have in my kit. But more on that in a couple of months!) But for a really great brush there is one brand I go back to again and again and so part of this prize is the LY38 Tapered Shadow Brush from Louise Young. Whether adding shadow to the crease of blending out edges this is a beautifully shaped, soft brush. Louise Young Cosmetics is one of the go-to brands for pro-make-up artists and her brushes are in my personal brush pot and make up a large part of my kit collection. subscribed :) thanks for this chance!! Fab giveaway, I like that you are providing an extra brush and the primer, to make the prize more complete. I totally agree with you that most brushes that come with palettes (or single eyeshadows for that matter) are rubbish, and don't even get me started on those horrid foam-ended applicator thingys! Just followed :) Happy Blog Birthday!